Absolutely fabulous - a cracking fish – and one of the best early-summer Upper Ouse chub reported in years – that is Phil Lee’s 7-1. A heavily-muscled golden bar of a fish, and set to weigh a fair bit more come the winter months, it fell to a boilie fished in Olney’s town millpool. 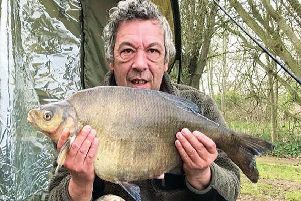 And its capture is sure to bring a rush of anglers to the banks of the upper river – rods who have been holding-off pending what they perceive to be more favourable weather and water conditions. Also fishing an Olney section, Mike Clargis landed a 10-15 carp. On Bradwell Lake Willards’ Sean Wilson has been getting tench to 6lb and slabs to 7lb. Others have had tench to 7lb, bream to 8lb, carp to mid-doubles, and roach to 1lb. Lots of small silvers are falling to pole anglers. On Newport’s pits Ade Watson netted a 3-8 mirror. DATS, Thursday evening round, Furzton: Bardell 15-14, Patton 15-7, Ernie Sattler 15lb. Olney, Ouse: Pete Hawley 6-8-8, Paul Caton 3-13-8, RonBull 3-9. FIXTURES: Sunday, Lodge, MKAA summer league round; Tuesday (12th) and 17th, Olney Ouse opens 01234 240061; also on 17th, charity open, Furzton, 07970 047606. CLOSURES: today-thru-to Sunday night, Tear Drops 1 and 2 (and adjacent parking) closed for bowl concert – TD 4 likely to be ‘no go’, for practical purposes, too.